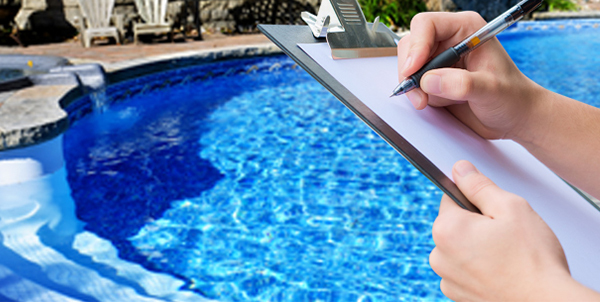 What is a pool inspection and why get one? Pools and Spas provide fun and relaxation for you and your family year after year. As with anything, continual maintenance and occasional repair will keep your pool or spa in the best shape for the longest time. If you are the buyer, how do you know how the pool or spa has been taken care of? If you are the homeowner, how do you let the current buyer know everything you’ve done to maintain your pool or spa? The answer is simple: Get a pool inspection! A pool inspection is designed to uncover any current or potential problems that may cost thousands of dollars and require a pool repair. A pool inspection is not a full run diagnostic on problem equipment. During the inspection, if problems are identified, recommendations are made on the next step for repair or replacement. Pool Body – This includes the pool and deck surface materials and conditions, the coping surrounding the pool, any tile or grouting, drains and skimmers. Pool Enclosure – This includes fencing, gates and stairs. Pool Covers—This includes an auto cover or winter cover. Electrical – This includes inspection of pool/spa lights, the presence of GFCI devices, circuit breakers, sub-panel box, timers, and control•s. Pumps/Heaters/Filters/Blowers – This includes operation of the pump, inspection for leakage, proper skimming and filtration, heater activation, filter functionality and the operation of the spa blower (if applicable). *Please Note:  The pool must be opened and operating at the time of the inspection. If it is during winter months, if the pool is closed or there is no power to the pad, the inspection is limited to what can visually be seen, but not what is running due to the system being inoperable. The CPO® Certification is an assurance to pool, spa and water feature owners that they are working with trained professionals.